When Donald Trump arrives in the UK later this week, he’ll be laying unusually low for a U.S. president visiting Britain, thanks to the throngs of protests expected in central London. The U.S. embassy in London suggests he’s not the only one who should do so: It told U.S. citizens in Britain Tuesday to “keep a low profile” for the duration of his trip—and to be aware of their surroundings. 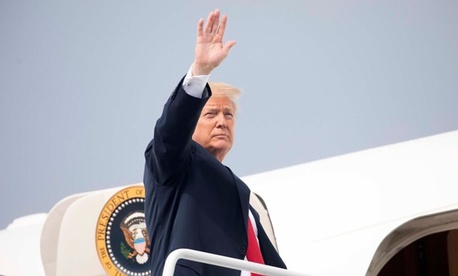 Some 50,000 people are expected to attend a protest against Trump’s visit on Friday – just one of several demonstrations that organizers have promised will be a “carnival of resistance.” Britain’s Police Federation has warned that the visit will put “unquestionable pressure” on the country’s security services—and almost every police force in England and Wales will send extra police to London to help keep order. A giant balloon of Trump as a baby will spend two hours floating over London’s historic Parliament Square, close to the houses of parliament, after the mayor of London gave permission to an activist who raised £17,000 ($23,000) for the cause. Almost all of Trump’s activities will be outside the city: He’ll meet the Queen at Windsor Castle, not Buckingham Palace. A black-tie dinner will be hosted in Blenheim Palace near Oxford. Bilateral talks with UK prime minister Theresa May will happen at her country home in Chequers, and not at the prime minister’s London residence, at 10 Downing Street, as is traditional. Then, Trump will head to Scotland for a few days.